I'm sure you've heard of SnapChat, the mobile app that lets people send photos and videos that disappear after a set period of time. Now there's a new app called Hellow that puts another twist on the concept of image messaging. 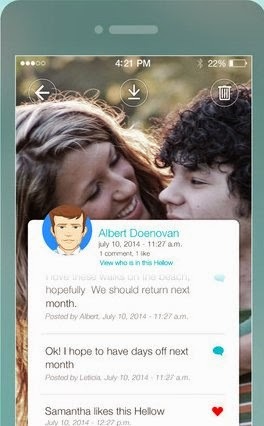 With Hellow, users can take a picture, add text, and send it to any friends they choose. Users can also set a time limit for when their friends get to see the photograph and it lets recipients know when a photo was sent, when it will be available to view, and who sent it. When you get a Hellow photo, a chat feature opens up that's available to everyone tagged in the photo. The people who receive the photo can save the image to their smartphone or delete it. They get to make that decision rather than the sender. Hellow is currently available in the iTunes store and an Android version is in the works. You can also follow Hellow on Twitter and Instagram.